In Île-de-France, just north of the town Milly-la-Forêt, is the small town of Dannemois. In 1970 Jean Tinguely purchased a large house there, and Niki de Saint Phalle and he stayed for several years while constructing Le Cyclop. The “Commanderie”, also known as “La Louvetière”, once belonged to an Order of the Templars. Intrigued by the mysticism of the property, Saint Phalle and Tinguely searched the house for the Templars’ treasures, but never found any. They did, however, find secret passages that led out of the village and another that went to the church. During WWII the house was used as a field hospital. Between the templars and its more recent history, guests staying with Saint Phalle and Tinguely always felt the house was haunted. The village is most famous because it is where Claude Francois, a french pop singer lived. When he died in 1978 he was buried in the Municipal Cemetery of Dannemois, just across the street from the artists’ house. It is the second most visited cemetery in France after Père Lachaise. A portion of Francois’ property has been turned into a museum, where visitors can see parts of the garden, the water mill, and his living room. 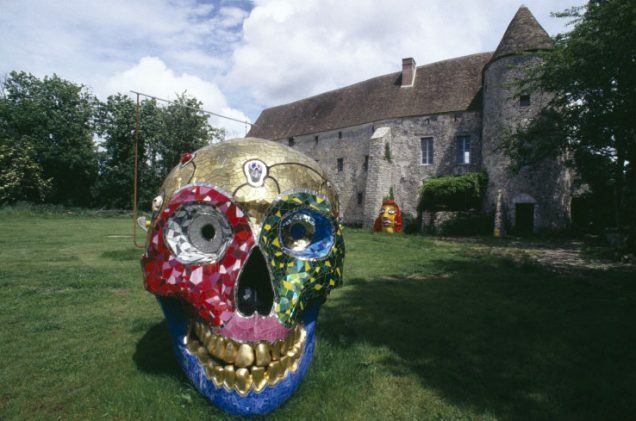 Many residents of the town knew of Claude Francois but not necessarily of Niki de Saint Phalle and Jean Tinguely. The city council and a few individuals came together and decided to change that. The house “La Commanderie” became a kind of headquarters for a number of artists. Eighteen of them were involved in the Cyclop project including Eva Aeppli, Bernhard Luginbühl, Jean-Pierre Raynaud, Larry Rivers, and Daniel Spoerri. Other artists, as well as race car drivers, also came to visit the pair in Dannemois, like Keith Haring, Jacky Ickx, and Niki Lauda. Keith Haring recalls his visit to the Le Cyclop and “La Commanderie” in his journal. 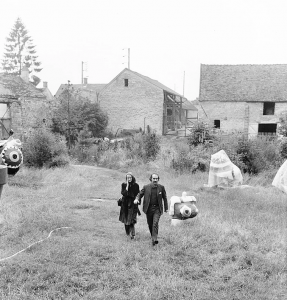 Niki de Saint Phalle and Jean Tinguely worked on a number of projects besides Le Cyclop while in Dannemois. Both films “Nana Island” and “Un rêve plus long que la nuit” were made while the pair was there. Niki de Saint Phalle wrote the script for “Nana Island” and constructed the sets; Jean Tinguely constructed the men’s costumes but the film was never completed. “Un rêve plus long que la nuit” was a completed 90 minute film, directed by Fréderic Rossif and Niki de Saint Phalle. Saint Phalle also wrote the script and designed the sets, while Jean Tinguely conceived the machines. 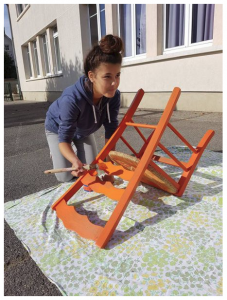 In recent years, the town of Dannemois has put into motion a project to better the communal buildings and put the spotlight on Saint Phalle and Tinguely. In 2014 the team began campaigning their plans and in 2015 were elected into city council and started funding. Their project consisted of renovating and combining the school and village hall, renovating the old town hall, and creating a village square once all the communal building we linked. The space was to become a place for culture, exhibitions, and discussion. They also wanted it to be a space to enrich students and offer extracurricular activities for them. The city council decided this would also be the opportunity to bring attention to Niki de Saint Phalle and Jean Tinguely and tie in the importance of the two artists. The old town hall will be renovated and called “Maison de la Culture” (The House of Culture). It sits right across the street from “La Commanderie”. A group of kids are also honoring the artists by working on a collaborative art project together. The children decided to create a bench out of four separate chairs. 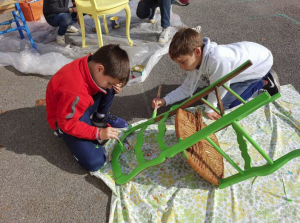 Each chair would represent a season and they would paint them, assemble the chairs together, and then add additional pieces of wood and metal to create new shapes. The children were inspired by artists’ bright colors, fantasy, and importance of nature and are incorporating those ideas into their designs for the bench. While the children are still working on their bench and work on the buildings are progressing quickly, the project is set to be finished any day now. Niki de Saint Phalle’s and Jean Tinguely’s signatures will also be incorporated into the project for guests to see as they enter the space. The House of Culture will have its inauguration on January 28, 2018. The Niki Charitable Art Foundation has also donated graphics to Dannemois that will be on display at the House of Culture.